Christmas is big business these days, isn't it! Long gone are the days of throwing up a few sprigs of holly and making some paper chains. Well, many of us still do that, but let's face it, there is a wealth of choice when it comes to decorating your house for Christmas now! Fairy lights everywhere, bespoke baubles on your tree, honeycomb decorations, Christmas jumpers, Christmas socks, special tableware. There is pretty much a Christmas version of everything! Personally, I love the chance to Christmasify (is that a word?) our house. I like to bring Christmas into every room so we have Christmas tea towels, clothing, flannels, fairy lights and decorations all over. Something I've branched out into in the last few years is Christmas bedding. It started a few years back when I bought a snowflake print set for our bedroom. I loved getting the bedding out at the end of November each year to put back on the bed. For about 6 weeks I wash the set each week and put it straight back on! This year I decided that I should add another to the mix so I treated myself to a new set in my favorite monochrome pallet with cute Christmas trees on from George at Asda. I thought it wasn't fair that it was only us who had Christmas bedding so I bought a set for Ethan too! Ethan loves the chance to bring Christmas into his bedroom and I'm happy to help him do so. He's got a mini tree, lights in his window and Christmas has even arrived in his dolls house with a mini light up tree and chocolate selection boxes for the dolls! So getting him a set of Christmas bedding seemed like the sensible thing to do! Of course, he's very happy with it. Now, all I want to do is buy a few more sets! Felix could do with one of course, and it's always good to have just one more spare... so that brings me on to all the wonderful sets that are out there! Primark are usually good for things like this. I mentioned Asda already. There are some good choices online as well. Of course, Christmas bed linen might not be for everyone but it does make a good present for your child if you're updating their room for Christmas. Quite often at this time of year you might be buying a new bed for them, or some accessories for their room. If we could afford it, we'd be getting Ethan a new bed for Christmas. So you could buy them a duvet set with their favorite animal or character on. The Yorkshire Linen Company have a good selection of bedding sets for everyone, particularly children. There's all the favorites like Peppa Pig and Thomas but also sets that will fit in with themes such as space or racing cars. Prices are great too starting around £12.99. You can't really go wrong! Hi all, sorry for the delay. We've all been ill on and off all week and now it's my turn and I'm feeling quite dreadful. So, I'm knocking up the linky quickly then going to collapse in a heap again. Hopefully you've all had better weeks health wise! From last week's link up I particularly love the hat that sweet Clem was wearing over at Clementine Rocks. Love that she's not all that keen on headgear - neither is my Felix! Sound the horn!! 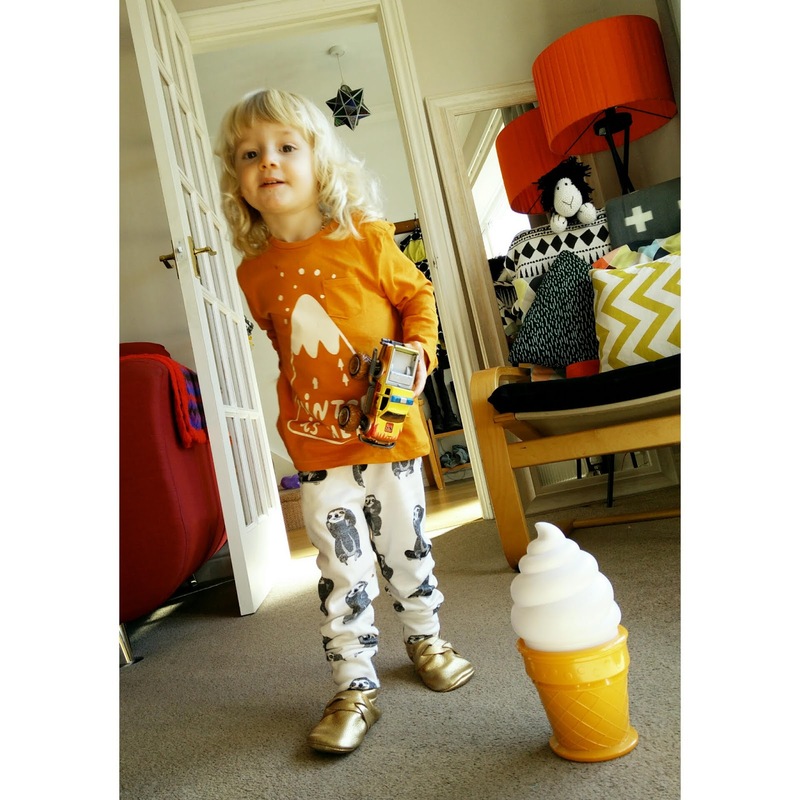 One of my absolute faveorite kids clothing brands, Mini Rodini has just released a small pre SS16 collection.. and it includes a unicorn print!! This is just a selection. Unicorns - such a good choice. I don't know anyone who doesn't like a unicorn print. I think it's great to have a more unisex unicorn print as well. My two love unicorns but so many clothes that have them on are unbearably pink and glittery. I'm going to order one of the jumpers! I love the bold orange and black spot print. It's simple but a real statement. The bag looks gorgeous but I love it on the clothes as well! Are you ready for another cool brand to be thrown in your face? Get those credit cards ready!! Like pretty much all brands I buy from these days, I found Lottie & Lysh on Instagram. Whilst they sell some of the more "standard" handmade fare (leggings, headbands, bibs) they also make the most amazing coats. They have some ready made ones (and they can be reversible!) but they also happily take custom orders! Felix is a real animal lover and right now he has a thing about raccoons. 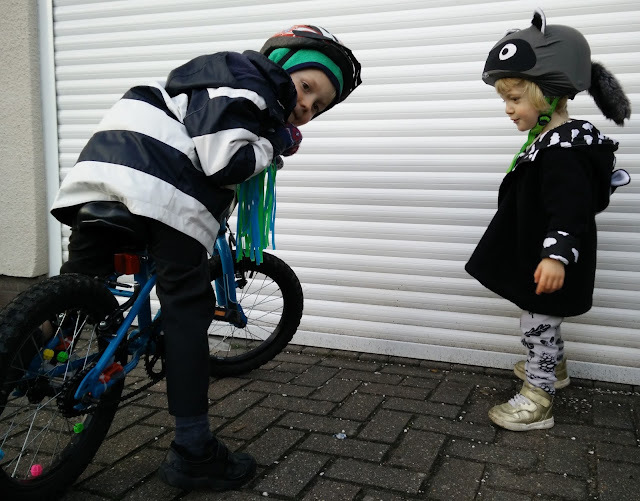 He has a raccoon helmet for when scooting, he has raccoon socks and now, thanks to Lottie & Lysh, he has a wonderful raccoon coat! Our custom order was for a monochrome raccoon. I chose monochrome cloud print for the liner and I believe the coat can be worn inside out, should we want! Best of all though, the hood has a raccoon face on it and it's just the cutest thing! When the coat first arrived Felix didn't want to wear it. He does that thing that kids often do and decided that as he hadn't seen it before it wasn't his and therefore, he wasn't going to wear it! A couple of weeks of seeing it hanging up on his peg and some cold weather this week and he was finally ready to wear it. I'm so glad. It looks brilliant and as you'd expect, we've had heaps of compliments! Now, if we're going out scooting, Felix says "Raccoon hat, raccoon coat and my golden boots Mummy!". Lottie & Lysh will be launching their new collection soon so if I were you I'd like their facebook page, bookmark their Etsy shop and follow on Insta! Zazzle have really opened my eyes this year. A few weeks ago you might remember me featuring a tiny selection of their printed t-shirts. Well, they don't just offer clothing! Not at all. Zazzle print on just about anything you can think of! Not only that, there are more independent artists and designers than you can imagine uploading their designs to be printed. You can type just about anything into the search box on their website and something will come up! 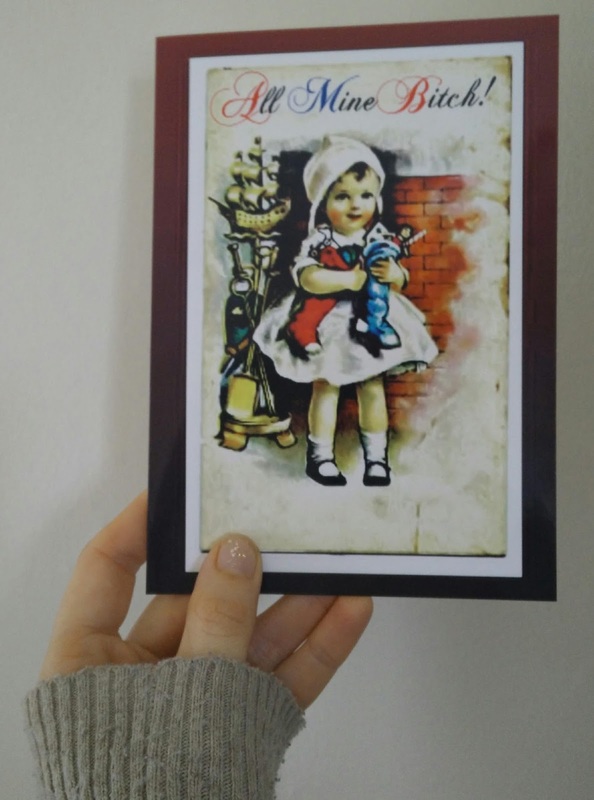 Zazzle stock a vast range of cards, postcards, invitations, stickers, wrapping paper. It's all there. I was very kindly allowed to try out some of their stationary goodies and I have to say it was a wonderful experience! When using Zazzle, you must brace yourself. Prepare yourself to be a little overwhelmed by choice. I would say it's a good idea to have something in mind when approaching Zazzle, at least at first. I decided I'd really like to find some retro/vintage style cards so when I arrived at their site I typed in retro Christmas cards and a whole heap of designs popped up! It took a while to whittle down my choices. There were so many fantastic designs I could pick. 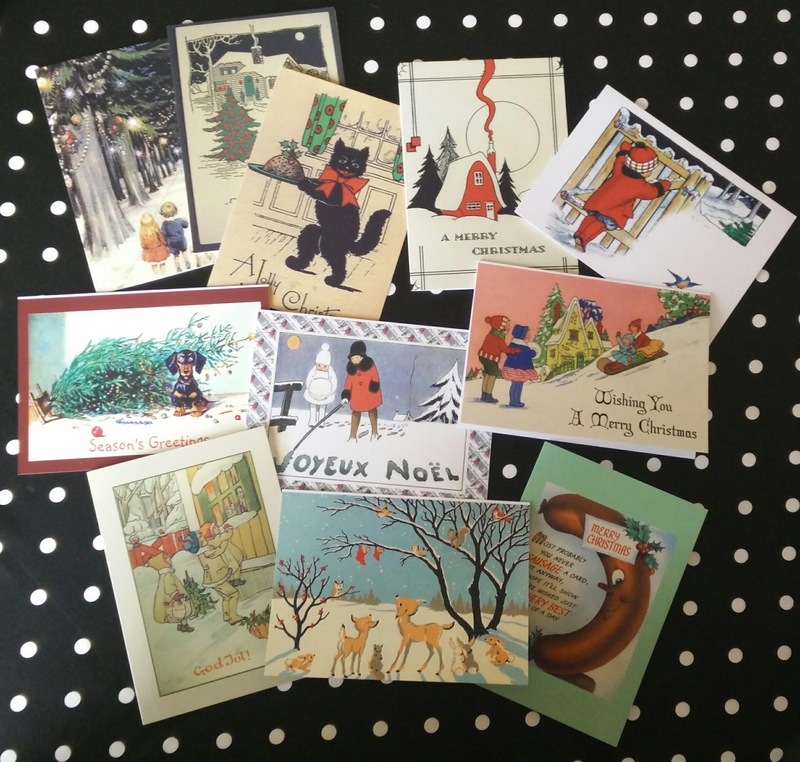 I chose a selection of cards but I was also drawn to their packs of Christmas postcards. I like the idea of a Christmas postcard. Something a little bit different! So, on top of my selection of individual cards I ordered two packs of postcards. I then decided to delve into the world of extras - stickers and labels! Again, Zazzle stock just about every kind of sticker and label you can imagine. I chose a pack of label stickers (for presents) a pack of return address labels to go on cards (as we moved recently I thought it'd be handy so people have our address!) and some stickers to add decoration to envelops and gifts. I've always experienced great service with Zazzle. The items all arrived quickly. They were securely packaged, not bent or damaged in any way. The quality of the card used is excellent. The cards are lovely and glossy and feel substantial. Same goes for the postcards. The stickers look brilliant, good quality, bright, well printed. 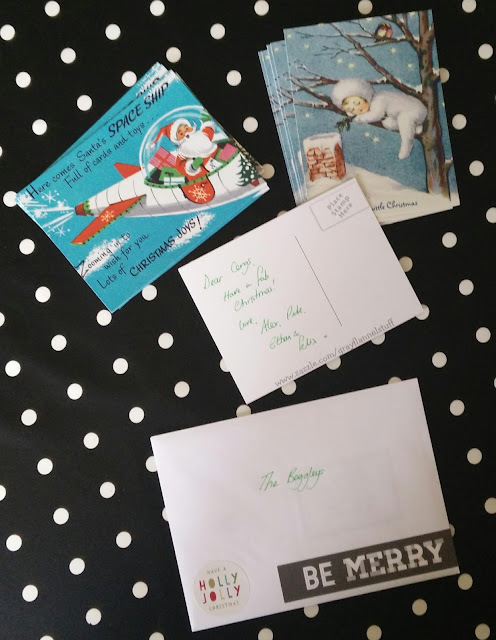 I really love sealing a Christmas card envelop with a cute sticker! I should add that the cards all came with an envelop - not the postcards though, of course! If you're after something a little bit special then I would wholeheartedly recommend Zazzle. And now's a good time to check them out because they'll have some great Black Friday deals on! Another week has rolled by - where does the time go? Welcome along to another Funky Kid Friday hosted by myself and Hannah from Make, Do & Push. I can't tell you how lovely it is to see more people linking up again. Really warms my heart! It does make picking a favorite outfit from the previous week a bit harder though! Last week I adored the cute bear knit Mummy & The Bubbas' Jacob was wearing. 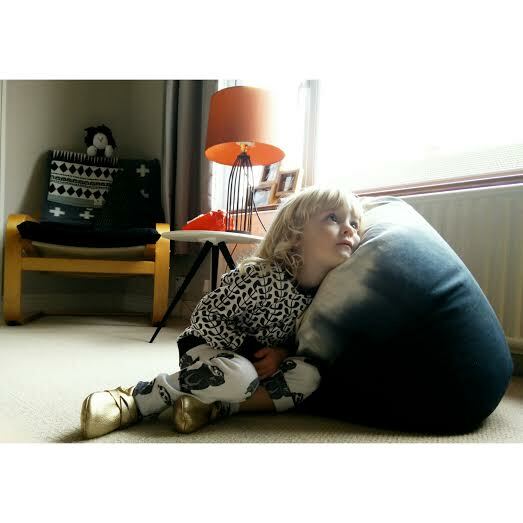 Paired with his monochrome cloud leggings from Fred & Noah and the brown boots - spot on! Earlier this year we treated ourselves to a new mattress. Our old mattress was 14 years old and had seen us through two pregnancies and lots of co-sleeping! We spent a fair bit getting ourselves a new one but we knew it would be worth it. Quality of sleep is so important, isn't it! Especially as a parent. Our nights are interrupted by the boys as it is so anything that helps improve what we do get is worth it. Now we have our new mattress, we are getting better sleep. Our bed feels wonderful. I have also recently made an effort to make sure that my phone is out of the way so I don't see the notification light flashing. As for the kids coming in and waking us up.. no idea how to stop that one! What do you do for a good nights sleep? Canvas Photo prints are economical and can be your best choice when you are on a tight budget. You can order any print you want on these canvases for a small price and enhance your decor. Replicas of your favorite art work can also be created on canvases with little cost. Ease of ordering online also adds up into making canvas photo prints a much more economical option for home decor. -Get it all printed up on one single canvas. Idea: Collect all of your favorite wedding photographs in digital format on one base through a photo editing software. Add date along with funny comments you want to make. 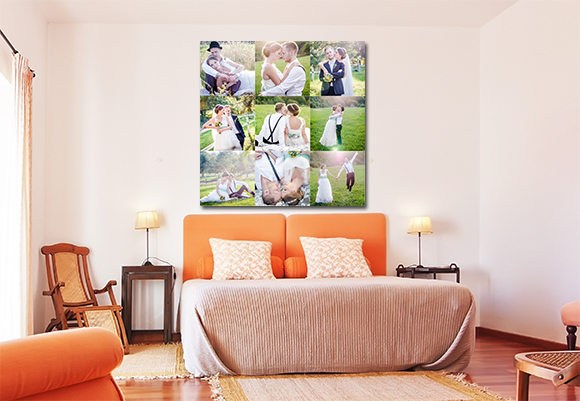 Order a canvas print of that image and give it as a gift on your wedding anniversary! Today you can easily order canvas photo prints online and they will be delivered to your house quickly. This not only makes it convenient but also allows us to order any print available online or any image that we have in digital format to be printed onto canvas. Canvas photo prints can be one of the best choices when it comes to decorating your house beautifully at low cost. You can either order canvas prints of different colors to match your decor or you can simply make a large collection of canvas images on the wall. You can create this focus wall with large and small framed canvases of different styles. There is no single rule of thumb when putting the images together but just a natural focus in the eye that can help create a balance on the wall that would make the photo prints look good altogether in a group. Canvas prints can be the best choice for any home or as a gift to your loved ones. They can be ordered online and get delivered at your friend’s doorstep for their birthday or any other occasion without any hassle. Simply order online for your own home or for friends and get the canvas gift delivered to their doorstep. Idea: Place all the memories of your kids on the wall of your living room as canvas photo prints. Enjoy looking at them as you and your kids grow. Canvas photo prints are durable and last a long time. They need very little extra care to keep them good. They will last for years to come if kept away from direct sunlight. Canvas photo prints can be easily cleaned with a damp cloth and do not require too much care or time for cleaning. Collect art work of your favorite artist on your walls by these canvas photo prints. Idea: Convert your corridor or stair case wall into an art gallery with art work printed on canvas and enjoy. You can convert your kid’s art work into a canvas print and let it last as a memory. All you need is to take a photograph of the art work and order its canvas print online. Idea: make an art gallery of your kids art work. Idea: get your kids favorite cartoon or Disney princess onto canvas and give them a surprise this Christmas. My boys are quite into their clothes. Not all that surprising, really! Mostly, I choose their clothes for them just to save time, especially on weekdays - well, Ethan has to wear school uniform, but for Felix. It saves us time in the morning if I've chosen his outfit the night before. However, this week, Felix picked his own clothes on Thursday morning and I think he did a lovely job! Lucky, I'm not afraid to mix patterns at all. 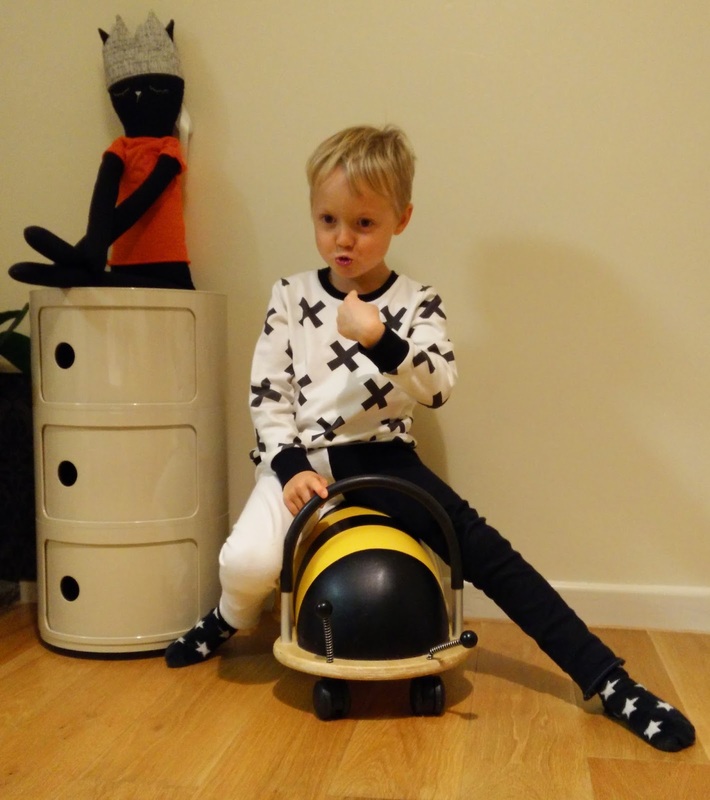 Felix chose himself two items and they both happen to be from one of our favorite Insta shops, Shop Haute. 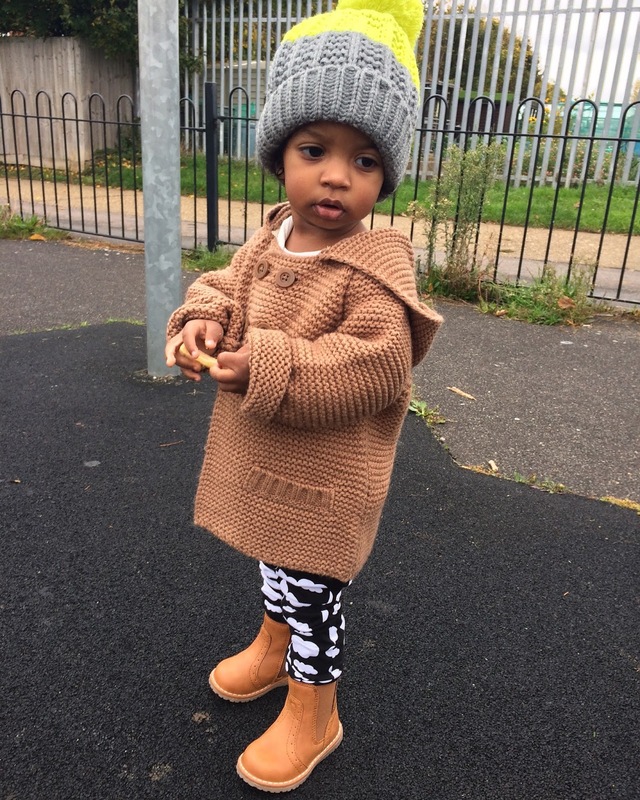 Shop Haute is one of the first kids clothing brands I found on Insta. They are based in Hawaii, a WAHM brand. The prices are great, the clothes are lovely, excellent quality. We still love them two years on! Do your kids ever choose their own clothes? Linking up with my kids fashion buddy Hannah for our linky Funky Kid Friday! 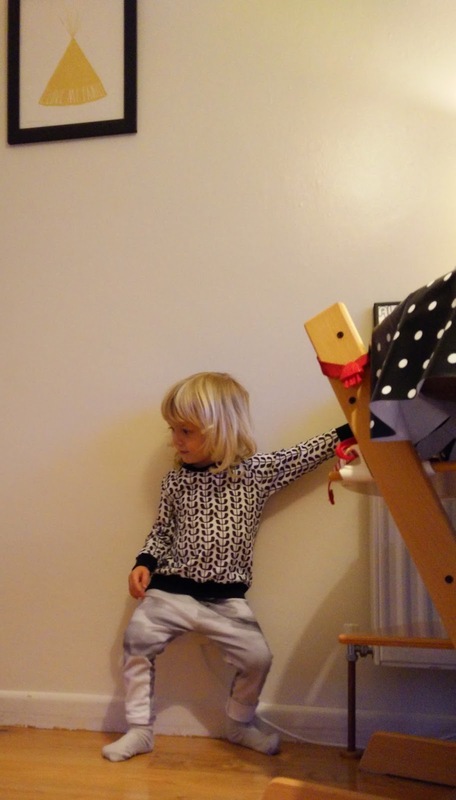 Changing your kids’ room for Christmas? Here are some top tips! Winter is on the way and around the country, many parents will be starting to get their children's bedrooms ready for Christmas. 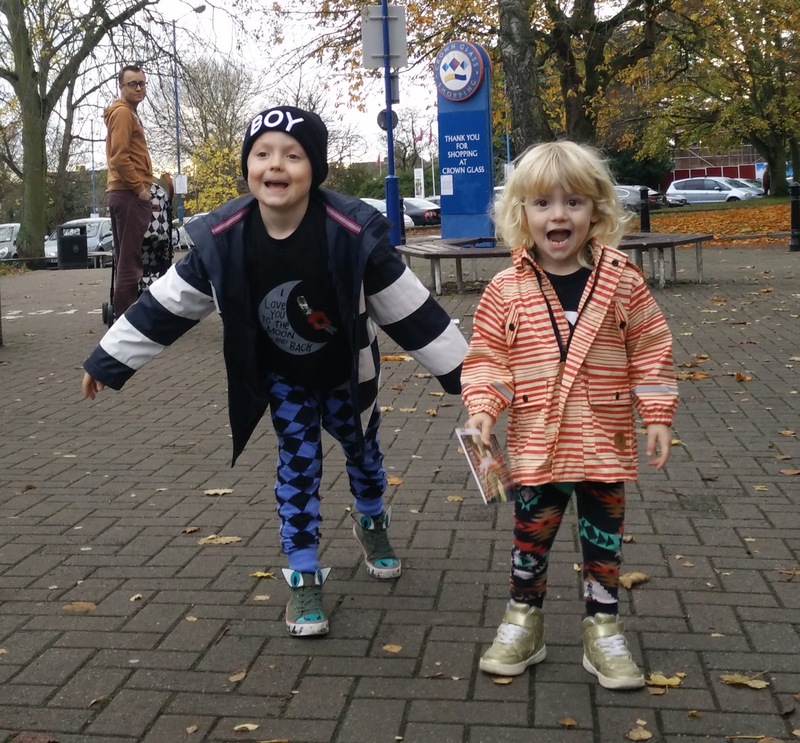 Whether they are simply putting bunting up around their mirrors or introducing a full-on grotto into the house, mums and dads will be trying their best to build up the excitement for their children – especially those with really young kids. We take a look at some of the best ways you can change their bedroom to increases the excitement levels ahead of the festive period. Use tinsel. Lots and lots of tinsel. Tinsel is a brilliant, cheap way to decorate your child’s room ahead of the festive period. Not only does tinsel add plenty of colour to the room, it is also pleasing on the eye and can be shaped to fit around inanimate objects, such as mirrors, cots and television screens.Kids love tinsel and parents should use this to their advantage. Whether they are newly born or approaching their teenage years, children will play with anything shiny and attractive on the eye. It will certainly help them to feel as though Christmas is approaching! You can buy your child a new bed and duvet set to further enhance the excitement ahead of Christmas. 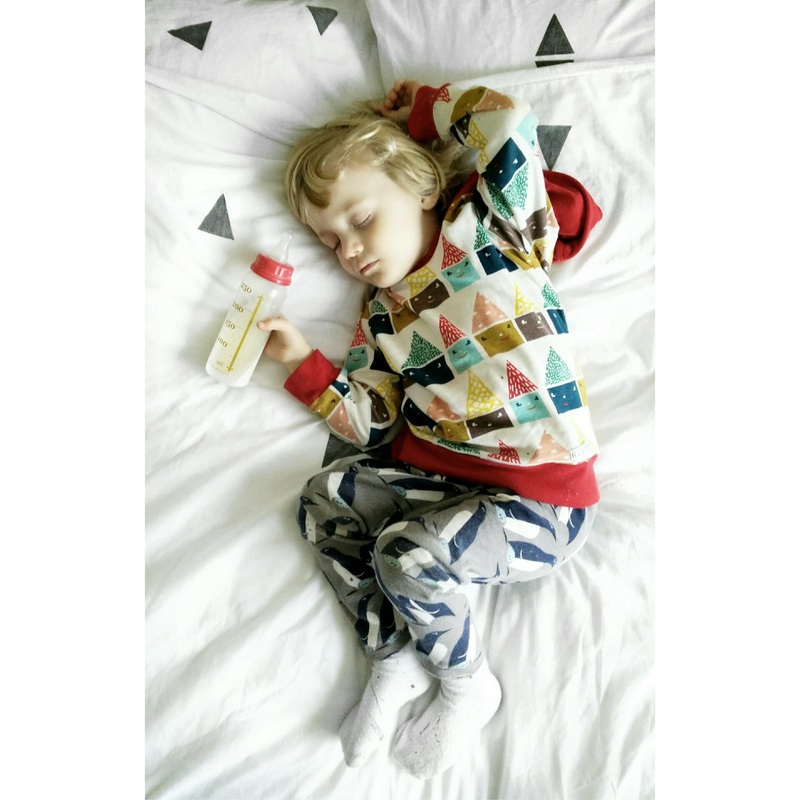 At this time of year, children are beginning to get more excited at the prospect of giving and receiving presents and an incredibly comfortable bed is an absolute must to ensure that they get plenty of sleep ahead of Christmas Day. There are a number of different beds available at Bedstar and you can get next day delivery on a new bed here. As well as the new bedframe, a new set of festive quilt and pillow covers will also help to raise the anticipation levels even more! Go all out… build a grotto! While this may affect the electricity bill, your children will LOVE this and is an absolute must for those willing to give their children the ultimate Christmas experience. In an ideal world, parents would be able to take their kids to Lapland, however that is not always plausible. With this idea, parents can build their own grotto and can even introduce their kids to Father Christmas! To truly appreciate Christmas, parents must go the extra mile to ensure that their kids enjoy the festival period. The homemade grotto is the perfect idea to enhance your child’s Christmas experience but they will also appreciate other, smaller gestures – such as dressing the room up with tinsel of buying a new, festive-themed bed. After all, the most important thing is that both parents and children enjoy the Christmas period! Don't you love it when you stumble across a bargain site? Sammydress is just that! I must admit that the name of the site threw me a bit but they stock a bit of everything. Not just clothes. But let's face it, I love clothes over here, so I thought I'd put together a wishlist - one for the boys and one for me! Felix in particular loves Elephants so I was thinking of him when I picked this top. It'd look brilliant paired with his elephant leggings from Fred & Noah. Christmas jumpers! I get the boys new ones every year. At least one. Sometimes more! We're quite into festive wear in our house - even the hubby has a few Christmas jumpers. The boys like to wear Christmassy clothing for the whole of December. So do I actually. This bear is cute, I think either or both of them would happily wear it - twinning is winning! 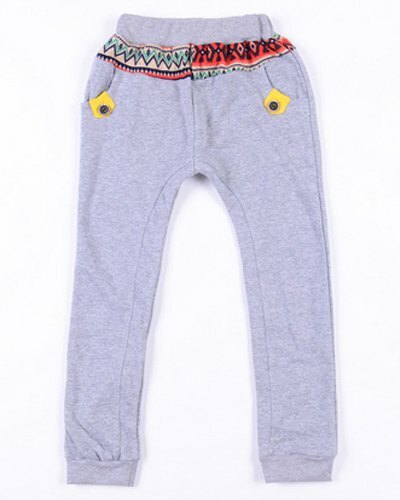 These joggers would go well with loads of tops the boys have. Grey is a great colour. Love the details as well. 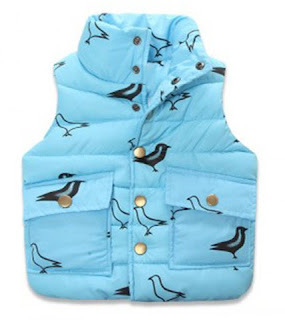 Love the print on this gilet. Unisex as well in my book. Felix loves any animals and birds fascinate him so I chose this with him in mind. Home Alone is one of our favorite Christmas films. If I'm honest, the boys ask to watch the Home Alone films all year long. This is a line that we quote to each other all the time! 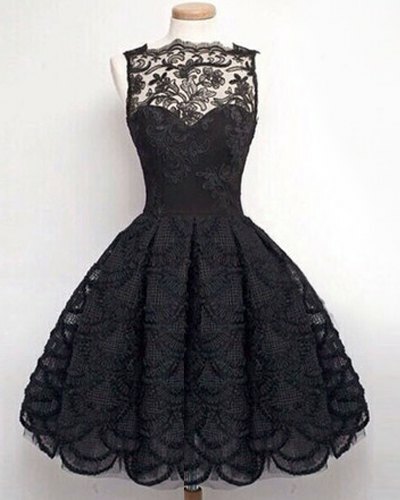 There's something classic and Audrey Hepburn about this dress. 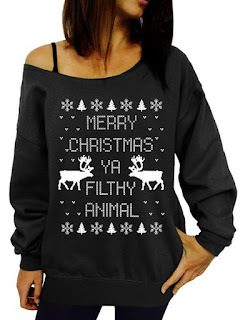 I'd love to wear it out over Christmas. Maybe even Christmas Day at home. I like to wear a dress on Christmas day. I would say New Years Eve but let's face it, I'm not going out for NYE!! 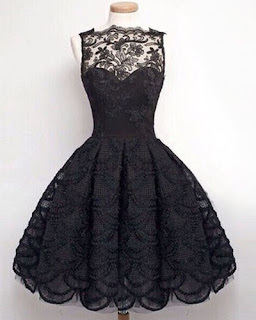 Love the lace detailing and the neckline would be flattering! 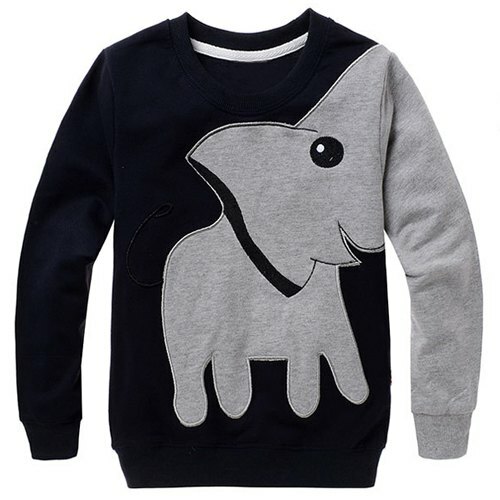 If Felix is going to wear elephants, I should too, right? I like the image on this one. 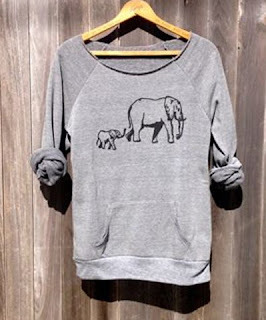 Mama and baby elephant. It's so cute! Cape coats have been popular for a few seasons and I don't think they are going away. They look great over big jumpers and you can get away with quite a few layers or thick jumpers under them. I love the colour on this one, it'll go with everything. They just look classic! So, bargains galore, I'm sure you'll agree! What would you pick? Don't you just love it when you order something online and it arrives less than 24 hours later! 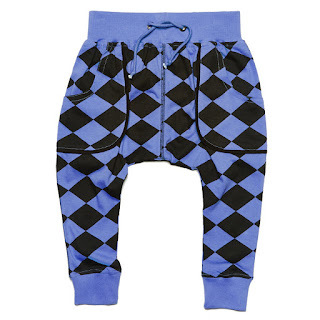 Last week I wrote about Five Boys Clothing and the fantastic trousers I'd ordered from there. Well, they arrived in int he post early Saturday morning and Ethan wanted to get them on straight away! I've bought Boys & Girls clothing for quite a long time now. In fact, they were one of my first blog sponsors! Their clothes never disappoint. These trousers certainly don't. They look amazing on. Ethan remarked on how soft they are. They have pockets which he loves. There's absolutely nothing negative you can say about them. They are age 5-6 and Ethan is over 6 now so I suppose you could say they come up a big large. But then Ethan is quite diddy. 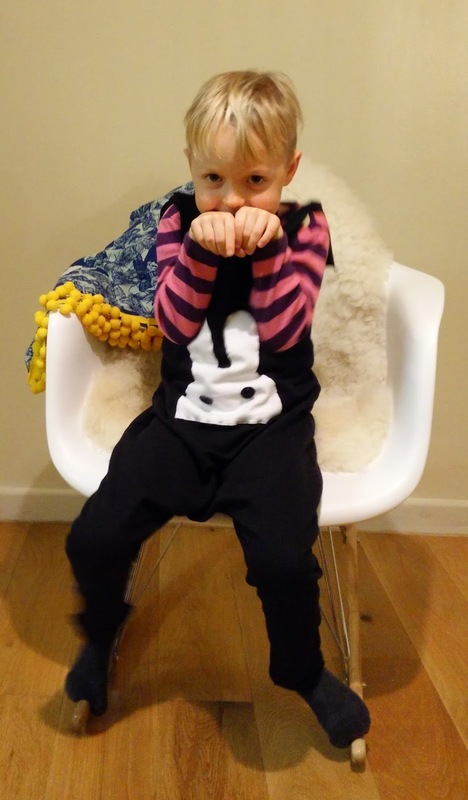 Something else Ethan was rocking over the weekend was his brilliant bunny dungarees from Polish/Irish brand Famstyle. I bought them a little while ago but they got a bit misplaced during our move so we only rediscovered them recently. When I found them Ethan said "What are those cute clothes? I want to wear them all weekend!". Bless him. He loves the cute bunny face. I like that they are unisex and something a bit different. Why shouldn't a boy wear a bunny? He looked lovely and found them great for romping around in. Have you had a parcel turn up really quickly before? I always find it exciting! Hello and welcome to another Funky Kid Friday! Wow. Isn't it horrible out there? I'm expecting some more wet and wintry fashions to be linked up today. We got well and truly soaked on the school run this morning so now I'm wrapped up with my wheat bag, laptop & coffee!! Thank you to everyone who linked up last week and of course my awesome co-host Hannah for hosting. It was amazing to see 15 link ups last week. Let's see if we can beat that today! Would be fantastic. Funky Kid has been my baby for years and it's nice to see it growing a bit! I was struggling to think about what I was going to write about today for Funky Kid Friday because, in all honesty, I don't think the boys have worn anything this week that I've not featured before. I've not even taken many photos! 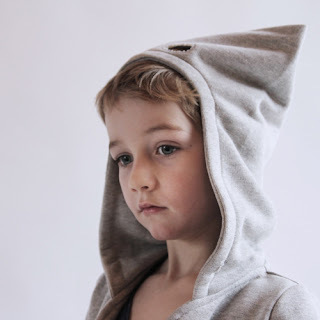 However, I was online this morning browsing cool online store Five Boys Clothing and thought, hey, why not feature them! I discovered Five Boys Clothing via Instagram. That's where I discover most places these days! They stood out to me because I have two boys. It strikes me (not surprisingly) that most fashion and shops for kids are marketed towards girls and their mothers. Obviously I prefer unisex fashion but I can't deny that I found it exciting to see a shop that's focus was cool clothing for boys. The reality is that Five Boys Clothing is very unisex. They stock brands like The Bright Company, Boys & Girls and Gardner & The Gang so you could just as easily buy clothing for your girl from them. 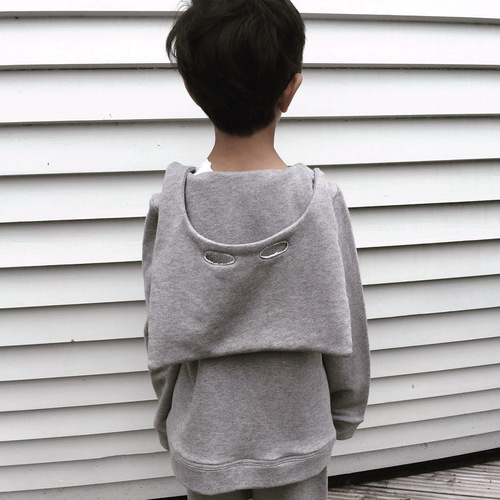 It's a clever idea calling themselves Five Boys Clothing, though, because I think it'll encourage parents who are searching for "boys" clothes to broaden their horizons a bit. I have to mention their sale section - it's pretty epic right now including some fantastic Tootsa Macginty items, some Gardner and Boys & Girls. 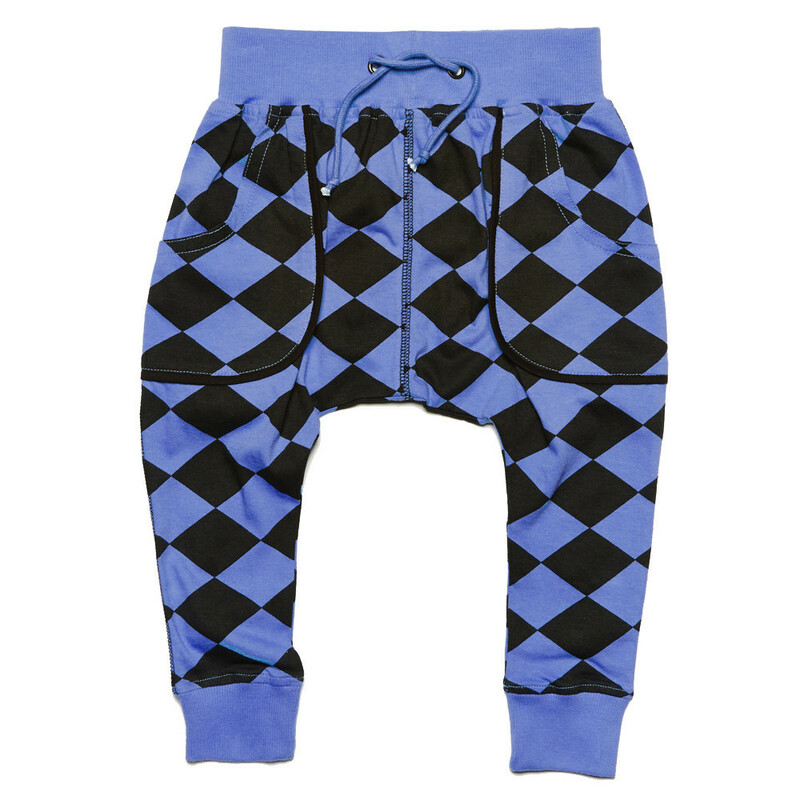 I just bagged a pair of those amazing harlequin harems for Ethan for £10!! 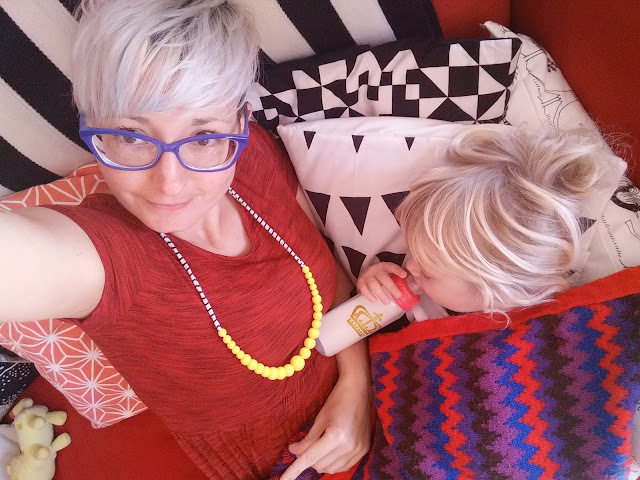 I'm linking up with my co-host Hannah over at Make Do & Push for Funky Kid Friday today. Go check it out and join in! What wood you play? 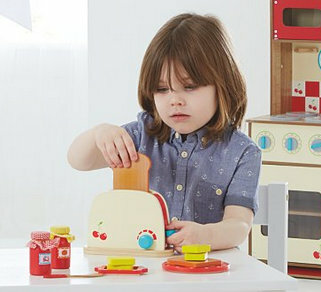 Gorgeous wooden toys from ASDA! Wooden toys. They look so beautiful, don't they? I remember when I was pregnant with Ethan that I was dead set against plastic-y, garish and noisy modern toys. 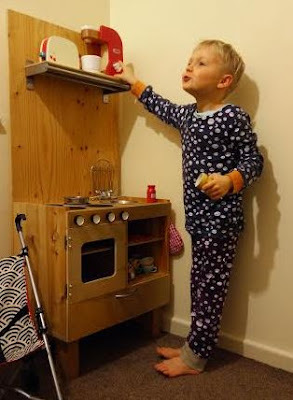 I loved the idea of Ethan playing with wooden toys, found objects (putting a basket of random house stuff like material, wooden spoons, measuring cups etc together) and my old toys from my childhood. In reality? Yes, there have been a fair few new plastic toys. It wouldn't be normal or fair to deprive him of them. Also, there are may occasions where he has been given such toys by friends and family. I cannot deny that if I've found them not being played with they have been quickly given to charity.. but overall, both my boys have a balance of plastic and wooden toys. A principal I do like to stick to is quality. I think it's all too easy to fill your house with plastic tat. The kind of thing you find in the pound shop or get in cracker or party bag. I try where possible to only get things that will last. This is mostly because I don't like waste! I hate thinking of landfills full of crap. Quality doesn't always mean expensive. I happily buy second hand. I look around for a bargain. You can find quality in both wooden and plastic toys. And yet... I still prefer the wood. What is it about wood then? It's nice to handle, I feel. Softer. Warmer. I like that if a wooden toy gets a bit bashed about it seems to add character whereas a bashed about plastic toy just seems to end up, well, broken! When plastic breaks it leads to nasty jagged edges. Wood mostly dents. I do like that with wooden toys you don't tend to get sound-effects provided. The boys create their own. Whether it's chooo-chooo-ing for the wooden train set or making the noise of the steam from a wooden coffee machine, it's imaginative play. 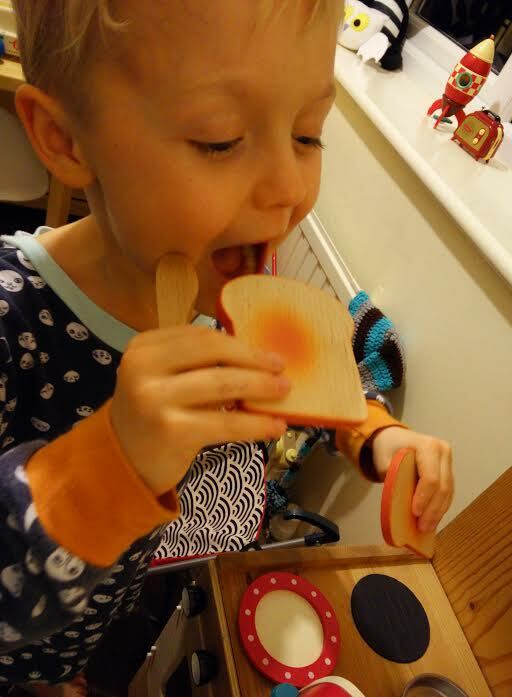 I was contacted by Asda recently, asking if I knew about their range of wooden toys and if we would like to review one. As we were in the throws of moving house I thought it best we pick something fairly small. I had a new (second hand, handmade by my friend) wooden toy kitchen that I was keeping in the garage, intending it to go in our playroom when we moved house so I thought the boys would enjoy something that would go with that. 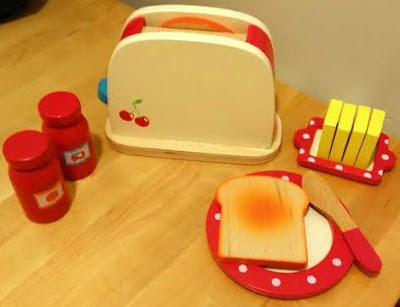 There were fair few cooking/kitchen/tea set toys to choose from but I plumped for a breakfast set which included two slices of bread, a toaster, a plate, jam, marmalade, a knife, butter and a butter dish. As soon as we were set up in our new house and had a chance to get the playroom together, I showed the boys the set and they were excited to get playing. 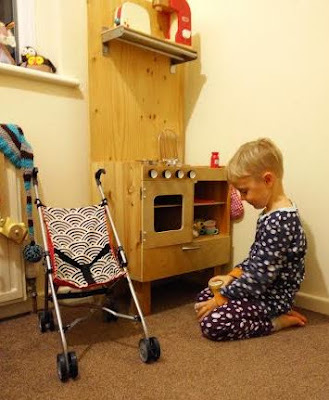 I moved the toy kitchen into the playroom and then we set up all the bits I had for it including the breakfast set. The boys then set to playing! What did I notice about the toy? Well, the packaging was good. It was well packaged inside, secure, nicely wrapped. The price was amazing. All of the Asda wooden toys are a fantastic price. The breakfast set is lovely to handle. The wood is smooth but sturdy. It's been played with for a few weeks now and there have been no breakages. I asked Ethan what he liked about it in particular. He told me "I love how the toast pops up from the toaster! It feels real!". Now, that's a genuine quote from him! I have to agree though, it's a great fun action. Felix loves the little jam and marmalade pots. He plays slightly differently to Ethan. Not surprising, Ethan is 6 and Felix is 2. Felix likes to pretend the strawberry jam is "strawberry juice" and I'm forever being presented with a "bottle of strawberry juice". He enjoys the butter as well (the slices of butter stick together with Velcro) though he insists it's cheese! No matter what the boys are doing with it, there is no doubt that they are fueling their imaginations. I love toys that imitate life. 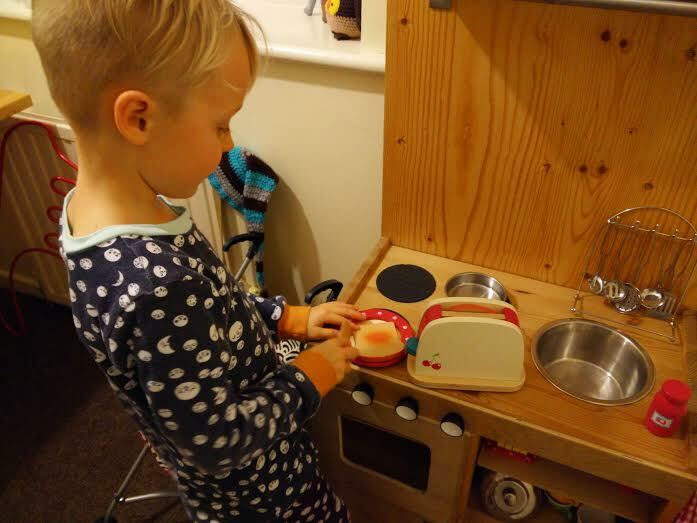 Chores that are mundane to us are exciting and intriguing to our children and it's lovely to have a way for them to mimic us safely. There are few things more heartwarming to me than to hear my boys playing nicely. Hearing them serving food up in their kitchen, munching on pretend toast. It's wonderful. At least when they are playing with wooden toys I know the only thing that is going to "run out" is their energy, not batteries! Good all round for everyone. Also, I have to say kudos to Asda for using a very handsome young chap with luscious hair in their catalog photos for this toy! Unisex toy win! The wooden toy range starts from £5 and includes everything from dolls house accessories to balance bikes to outdoor play equipment! Thank you to everyone who linked up last week - it was nice to see so many of you! I would like to give a shout out to Jack's Paper Moon and Noah's wonderful knitwear! What a hat! This week, I am writing about (shhhhhh) Festive Fashion!! Now it's over to you! Please link up below and spread the word! Is it too early to be thinking about Christmassy clothing? Well, as November is just hours away, I think not! After all, if you don't get planning and buying now, it'll be too late! Last December I ran a kids fashion tag on Instagram, #12DaysChristmasKids. I gave 12 prompts and asked people if they would like to join in and tag their photos. Quite a few people did and it was a lovely display of festive fashions. Great fun. At the moment, I'm not sure if I'll be doing the same this year but one thing is for sure, I'll be digging out all our Christmas clothing. Christmas or festive clothing is a tricky one. After all, if something has Father Christmas printed on it, it's only going to be worn a few times a year. Add in the fact that children grow quite quickly when they are young, well, you have to think carefully about cost. I tend to buy Christmas/Halloween/themed clothing larger than the boys need so they can wear it for two or three years in a row.. And of course, anything Ethan wears I hold on to for Felix to wear later on. So at least most things get a good few wears. I also look out for bargains online and in charity shops. 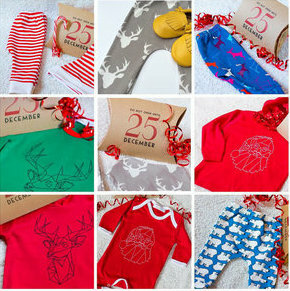 1) Smafolk & DUNS (available at Funky Little People and others) - Smafolk and DUNS relese a new range of Christmas clothing every year. Their clothes last really well, wash well, are soft and look wonderful. Ethan has a top from them which he has now been wearing for 3 Christmasses. It still looks fab. 2) Supermarkets - Each year I pick up a few little bargains. Festive socks, slogan tees. 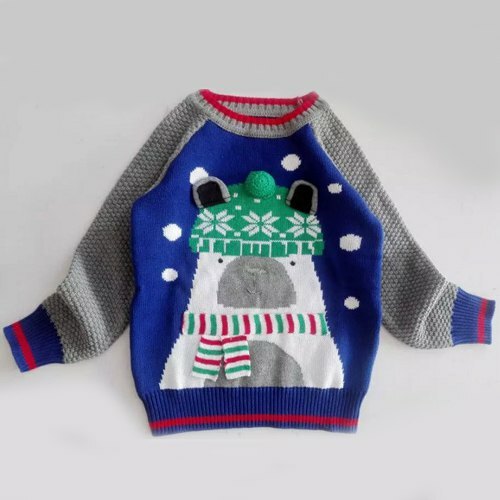 If you are looking to boost your child's Christmas wardrobe for a small price, places like Asda and Tesco are great for this. Sizes tend to be more snug so I often size up. 3) Charity shops - Obviously Christmas clothing doesn't get much wear and charity shops often end up with a heap of it which is in great condition. Come the end of November they start getting it out. Great for Santa suits and fancy dress items. 4) Independents - If you are looking for something a bit special and want to support smaller business, independent is the way to go. 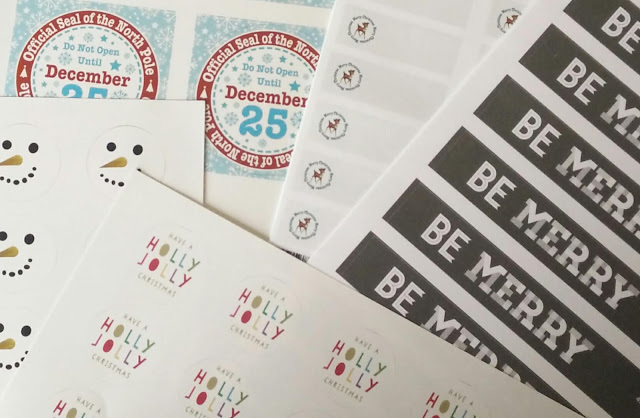 Etsy and Instagram are awash with cool small brands showing off their Christmas '15 wares. My faves this year come from Fred & Noah. They are seriously storming it with their Christmas collection. 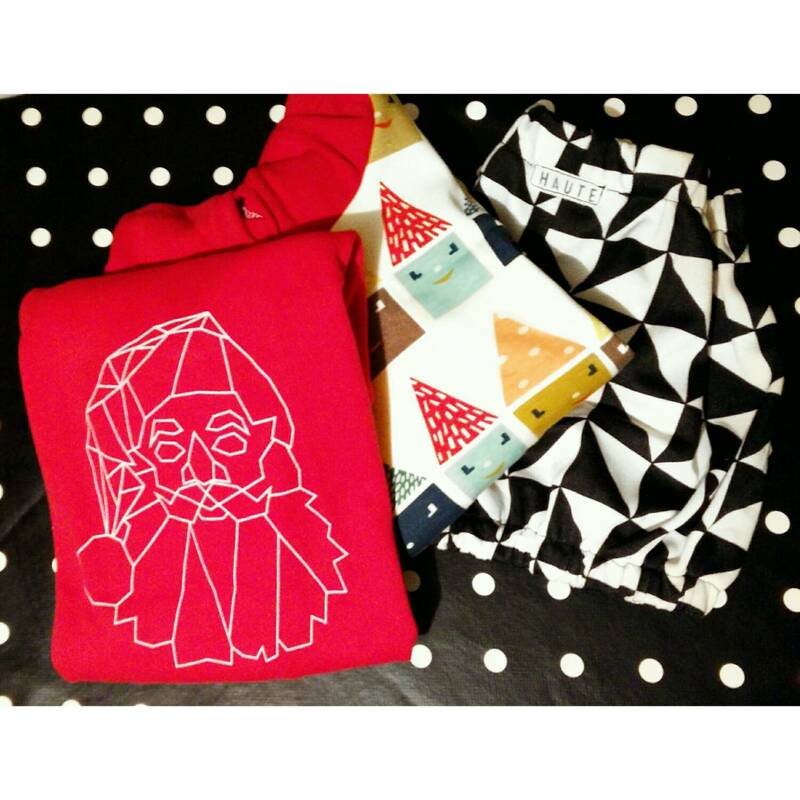 An amazing geo print Father Christmas, reindeer and good old candy stripes. Love it! 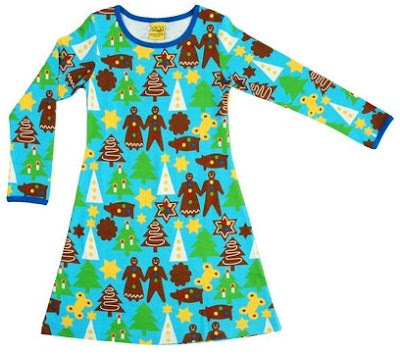 Have you ever bought any Christmassy clothing for your children? If so, do you go all out or is it just for Christmas day itself? 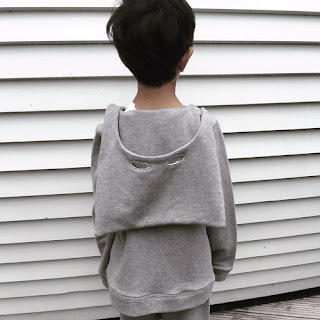 Don't forget to link up your kids fashion posts today (see top post). Sorry folks. Were you hoping for an answer? If you were, don't worry, we're in the same boat. If you happen to know the answer, share it, please!! 6pm - TV off (if it was on) or a relaxing/calming program. "Mummy, I want you to cuggle me!" "I want some water! Where's my water?" I know he's more than likely after attention. I don't go straight in. Sometimes he'll go quiet. If he's rampining up, I'll pop my head round the door and remind him where his water is. "I want to do a weeeeee on the pottttttyyyyyyy!" Felix is more than capable of taking his night nappy and clothes off and doing a wee on the potty but I also know that he is then likely to attempt to empty the potty down the loo. That's a mess I could do without, especially on new carpets. So, yet again, I'll find myself in his room. Once the wee has been dealt with I'll tuck him in again. This time I'll make sure my voice is very firm, tell him he HAS to stay in bed. He needs to sleep. We all need to sleep. It's night time. Everyone is sleeping (ha!) and Mummy & Daddy are extra happy when he stays in bed and sleeps. Usually this works and he goes off to sleep. It's now about 8:30pm and Pete and I still won't have eaten. We usually manage to eat around 8:45-9pm. It has been as late as 10:30pm before. Once we've eaten, we are, of course, worn out. I rarely have the impetus to work on the blog at this stage (that's why you see so little from me!). As we moved house recently, we spend these precious moments trying to put pictures up or choosing our potential bathroom suite! Sometimes I do risk staying up late to work on blog work or magazine work. Or even doing things in the house. You can guarantee that the night I stay up until 1am Felix will wake at 2am. Nights with Felix are varied. At the moment he mostly wakes at 4am. He'll want milk. We've tried cutting milk out during the night before. After 5 weeks of screaming every night we gave up. If he has milk at the moment he'll likely want a wee shortly after. This has been our issue most recently. Because he's been potty trained during the day for a few months now he's very aware of when he needs to wee and understandably doesn't want to "wet" himself. His nappy is just for when he's asleep. He's no where near the stage of having that taken away because it's always soaking in the morning. In fact, we often have to do a nappy change and potty visit during the nap. Often, if he's woken at around 4am it can be very hard work to get him back to sleep. Sometimes he just doesn't.. So our days often start very early. I've heard just about all the advice out there. I KNOW that if he had less milk he'd likely wee less at night and possibly sleep better. It can be very hard to get him to fall asleep without milk at times though. Milk is a source of comfort for him. He's not attached to any of his toys. He has never taken a dummy. It's his milk bottle or having Mummy/Daddy near by. That's it. 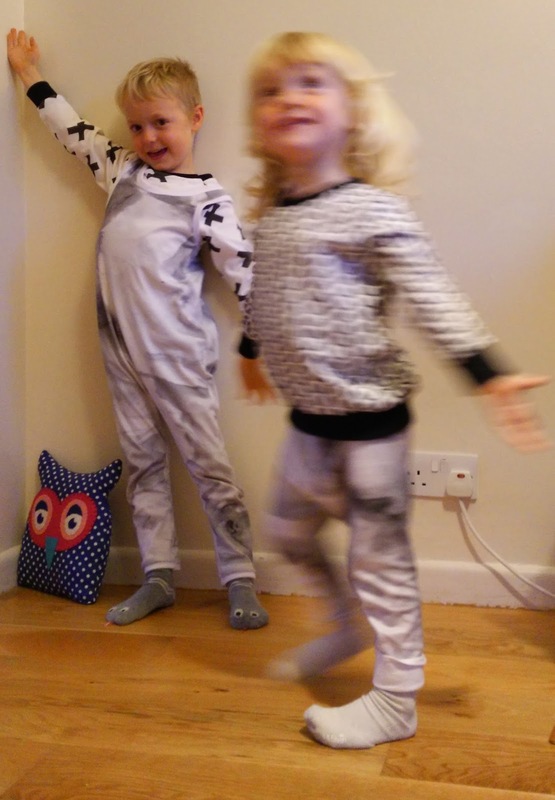 We know all about having a concrete predictable regular bedtime routine- we have one! Always have. It's hard dealing with this kind of behavior if you are conically sleep deprived. We are often so grumpy and fed up. Both Pete and I have felt very low at times due to the lack of sleep/disturbed nights. We have both said that the joy in life has gone. What is there to look forward to? We have no energy to do anything?! Every now and then Felix will throw us a life line. The odd sleep through. Like last night. Just when we were teetering on the edge he slept from 7:30pm-6:30pm. Bloody amazing. I feel on top of the world today. Well.. Not quite that good. I'm still missing a good few years worth of sleep, but I feel a darn sight better. We all do. Felix's mood is better when he's slept well. He's a nicer child to be with and we are nicer parents. Why can't he just do it more often? Life would be SO much better! My friend sent me a link a Woman's Hour radio show from the other week that featured sleep tips from Carl-Johan Forssen Ehrlin, the author of the now famous book, The Rabbit Who Wants To Fall Asleep. Well, it just so happens I bought that book back in August. The first night I read it to Felix I was skeptical. Would it work? Well, do you know what? It did. That first night. But it has never EVER worked again. Bugger. How does the book work? It uses NLP (neural linguistic programming). The types or words, the way they are put together and the tone of voice you use. It does work. It's a little like hypnotism. It has been successful for a lot of people. The technique is sound. I have found that if I talk to Felix using this type of language/tone then it really helps him relax and "come down" from a real tantrum. I don't think it was a waste of money, my purchase of this book. I just don't think it's a magical answer for us. A few months ago I discovered the gorgeous Born Free & Me on Instagram. Quite how Jules (who runs the business) does everything she does, I don't know. Not only does she have a baby, run Born Free & Me, she's a Doctor too!!! I hardly manage to blog and all I do is look after the boys, For shame! 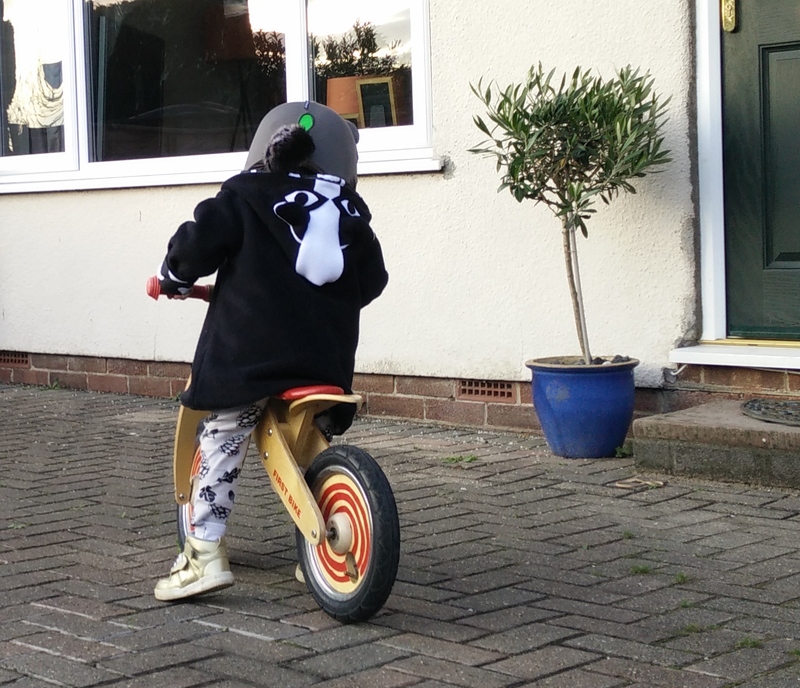 Born Free & Me are a UK based kids clothing company. 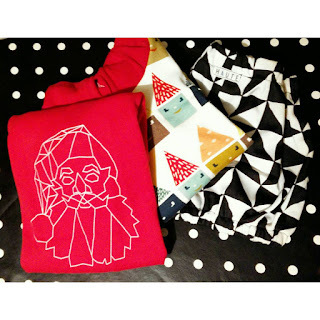 At present a small number of products are stocked (leggings, headbands and bibs) in two prints. I think this is a great idea though. It keeps things simple which I imagine is a must for Jules with a baby and another job. The other thing is that the two designs (skateboarding sloth and flamingos) were designed for Born Free & Me. So, these prints are unique and you can only buy them from BF&M. On top of that, they are just gorgeous. Hand drawn and then printed in the UK. Wonderful. A while ago I bought Felix some Skating Sloth leggings. I knew they'd become firm favourites with him because he's obsessed with Slowly Slowly said the Sloth. I was right, he calls them his "Slowly Slowly Sloth legs". He always pulls them out of his draws if he sees them! As he's worn them a lot I can tell you that they wash really well. The material is lovely and soft. The design is well printed, it's not wearing off in any places. For £14.99 I think they are a bargain. You are supporting a small WAHM business in the UK and getting something really different. - Tag us on Twitter - I'm @medicatedfollow and Hannah is @makedoandpush. We will retweet your posts. Don't forget to use the tags #funkykidfriday and #FKF as well! Earlier this year my boys were chosen to be brand reps for new UK Mama-made kids clothing brand Bowties & Candyfloss. I discovered Bows & Candy when the creator, Alex (good name :-D) was just starting out. I loved her designs and felt she wasn't getting anywhere near enough exposure. In fact, I messaged her begging her to stock larger sizes (she was only doing baby sizes at that stage) so I could get my boys in her clothes and show them off. Thankfully she obliged with some special custom orders and then for her SS15 collection was able to increase the sizes available. When Alex ran a brand rep search on Instagram I made sure I entered the boys and we were thrilled to be picked. We have been brand reps for quite a few brands now, some larger, some smaller, but I would say this is one that I am very proud of. I have really loved being part of the extended family of a brand as it grows. It gives me so much pleasure to help showcase the wonderful work these smaller WAHM brands are doing. 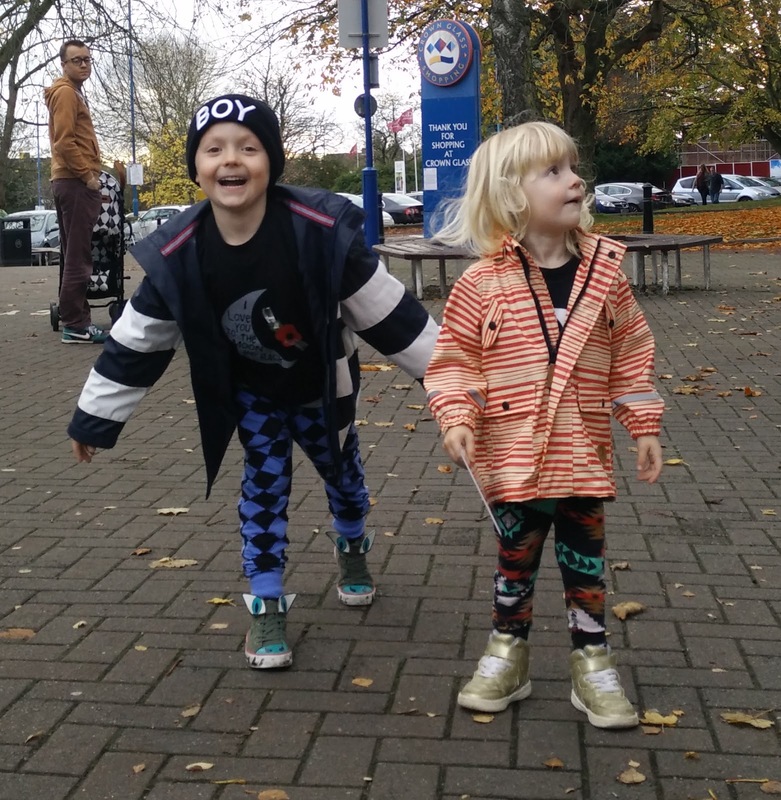 I love that my boys have clothes that are a bit more unique than your average. Bowties & Candyfloss launch their AW15 collection on the 23rd of October - not long! The collection is titled Oh so monochrome! so you know it's going to be great and bang on trend (as they say!). We received some items for the boys last week and they rocked them all weekend long so I thought I'd share some photos today. You can get a good idea of what's on offer if you check out Bows & Candy on Instagram.